I have a confession...I'm a washi tape addict. I may just have enough of it to circle the earth. And I need more. I love collecting washi tape, finding new ways to use it, and love adding it to my planner and bullet journal pages. If you're not familiar with washi tape, it's a tape that is a decorative and moveable version of masking tape. It comes in varying widths and thousands of fun designs. There are so many fun styles, you are sure to find something to fit your personality. Do you like sushi? There's washi tape for that! How about succulents? Yep, got that covered. Cat lover? There's washi tape for that, too! If you Google washi tape, you'll get more than 35 million results! In addition to using washi tape in your bullet journal, there are hundreds of other creative ways to use it. Check out my Pinterest Washi Tape Board for ideas. The problem is, once you start with one roll of washi tape it's hard to stop. You'll find another and another and another that you NEED. Then you end up with A. LOT. OF. WASHI TAPE. It's okay. You are in good company and there are lots of us with the same love of this adorable removable tape. So, the best way to harness your washi tape addiction is to create an easy-to-reference catalog. Here are some creative ways to keep track of your washi tape in your bullet journal. B.bulletjournal catalogs favorite pens on one side and washi tape on the other. Using simple dash borders keeps the system neat and organized. Bulletjournal.ideas_ keeps track of washi tape with adorable polaroids hanging from string. Favorite washi tapes include glitter, polka-dots, and marbled styles. Giulsweet_bujo created an elegant monochromatic washi tape page. The tapes featured by making hangers for each of them. It's a very sophisticated way to catalog washi tape. How about giving this method a try in your bullet journal? Bujoonly adds a simple black hand drawn border around her washi tape and then finishes it by drawing a tiny piece of tape that "hangs" each piece. The result gives the look of a wall of beautiful paintings. I love this washi tape swatch collection. Blujournal alphabet washi tape collection! Catalog washi tape from A to Z by making each one a letter of the alphabet then outlining the letter with a black marker. What a fun way to keep track of your favorite tapes. Ponystudies catalogs not just washi tapes, but each collection of tapes! Using a header for each collection, the washi tapes are also cataloged by using a unique frame for each style. Dotted borders, polaroids, framed paintings, and kites set each set apart from one another. Hang tags are a fun way to show off a washi tape collection. This is an easy to duplicate style to try in your bullet journal. Caliquynhletters made fashion washi. Dresses, handbags, and shoes transform simple washi tape into fashion forward pieces! Uncommonlines goes for a simple yet very effective way to catalog washi tape. On the right side, you'll find the name of the brand and when it wash purchased. If you have just a few favorite washi tapes, don't be afraid to catalog them. Studytako makes a simple washi tape swatch page by tearing a piece of each tape, sticking it on the page, then outlining it with a black marker. This washi tape page makes me so happy when I look at it! Washi is grouped by color and kind of smooshed together to create hanging banners of pretty tapes created by Love.being.creative94. Milqystrawbs polaroids are accented with stars, tape, hearts, circles and squiggles! Tracking your washi tape doesn't have to be boring! Get creative by making a bookcase and making all of your tapes the books! Craftableme makes an excellent example of this style on her bujo page. 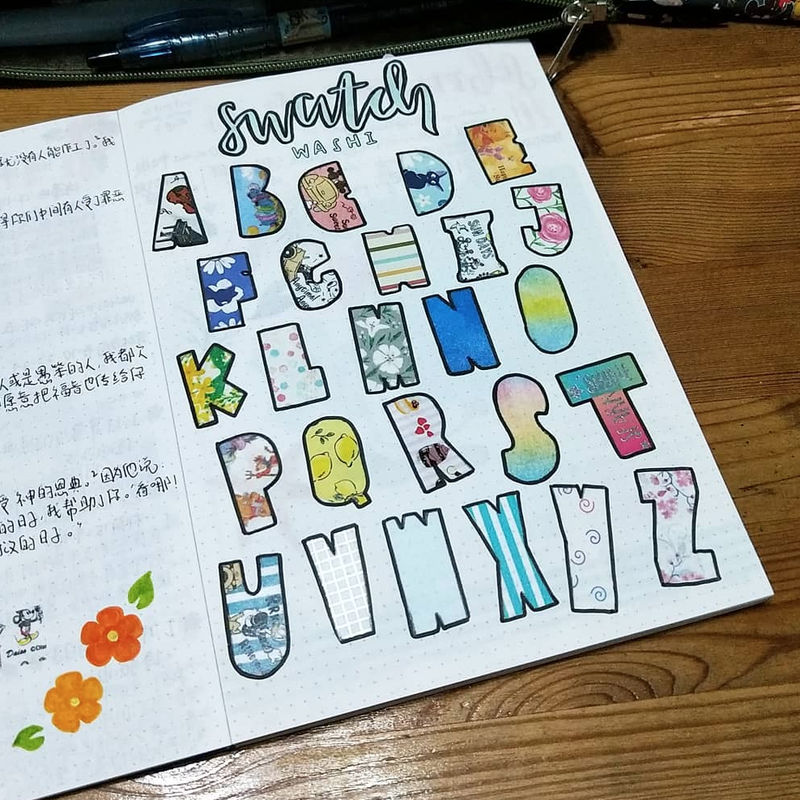 Princess_bujo uses paper punch tools to create an organized an consistent layout for her washi tapes. I love the circular scalloped edge washi tapes shown, left. If you have various sizes of washi widths use pinking shears as shown on the washi tapes, right. As if all this TAPE cataloging isn't enough, you can take the whole thing up a notch! Roxpaperstickers organizes all of her tapes by color in her bullet journal. It is a really impactful way to organize tapes as well as an easy way to add to each color as your collection grows. How do you organize your washi tape? I'd love to hear! Let me know in the comments below.